We all have tasks that we avoid until the last possible minute – tasks that, had we the money, we would never do again. Within my four walls, bathroom cleaning tops the list, followed in rapid succession by paying bills and clipping the nails of a reticent Labrador. Things are no different in the garden, no matter how much time, energy and love I put into my green kingdom. 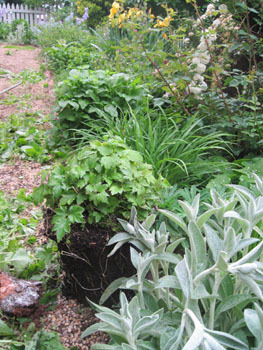 There are jobs that weary me to the core – such as weeding. There are jobs that threaten to destroy my sanity with their tediousness – such as watering. But the worst job – the job that screams for a plump checkbook and the guts to sign my name is the act of digging a hole. I am not adverse to hard labor (as the birth of my children and all days thereafter will attest), but the thought of coming home from a nice little jaunt at the nursery or plant swap with six treasures in tow and having to pull out a shovel and dig six holes of measureable size, twice as wide as deep, through root and stone, clay and bedrock, brings out the industrial strength procrastinator in me. Digging can be immensely satisfying when one has amended beds with all manner of compost, excavated in the past to a depth of five feet, and eradicated anything resembling a tree from within a square mile of the point of one’s shovel. The delicious feeling of having a spade sink effortlessly through a mouth-watering mix of all things soft and friable is one of those deep pleasures that happen rarely in life, and should be savored like a fine wine or a clean bathroom. 7) Realize that root loppers, small trowel, hair clip, handkerchief, forty minutes and a pair of foam padded gloves will be necessary to continue in this, the thirteenth labor of Hercules. 9) Go find my husband, beg for help and be rejected mercilessly. 10) Throw fish sticks in the oven for dinner, chill a large bottle of Pinot Grigio, put on my soldier’s face and enter Dante’s seventh circle. 12) Plant the little taskmasters and completely forget to water them until the next day, having opened the Pinot Grigio thirty-nine minutes ahead of time. So, with the two premises firmly established that (a) we all hate digging holes and (b) we’re still going to do it, let’s go over the basics of why we must dig decent ones, starting with the most basic question of all: Do you wish to dig a hole, or do you wish to dig a grave? Skimp on effort, whatever the extenuating circumstance, and you can kiss goodbye to the money you spent, the time you allotted, and the tears you cried. Plant roots are creatures of habit. Once wrapped in the confines of a nursery pot, they are hesitant to get out and see the world. If you dig a hole the same size as your plant/tree/shrub, and expect the roots of same to get excited about the subsoil lurking mere inches away, you are deluding yourself. You must give them a reason to expand their horizons before the going gets tough. 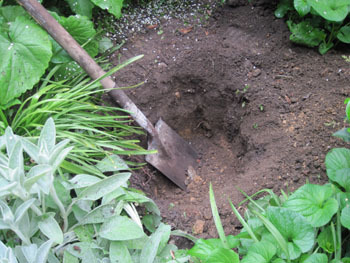 Once your hole is dug, don’t make the mistake of filling it with a straight mix of compost or manure. Half-mix it with native soil. Remember, those little roots need to get used to the cold, hard world and trying to pretend that life is a never ending all-you-can eat buffet will not prepare them for whatever calls itself subsoil in your garden. Years ago, I dug up and moved a one foot golden euonymus planted by my home’s previous owners. The original hole must have fit it like a glove, for the roots had never budged from the original shape of the three gallon pot after five full years in the ground. I replanted it with a generously wide hole, teasing the roots out of their pot-shape and had a gorgeous six foot shrub just a few years later – it just needed a reason to live. I know it’s hard. I know that the deck is calling and children are wailing for dinner. But the extra ten minutes you spend now will give your plant or tree the very best chance it has for survival. There are just too many things it’s going to have to battle against in the years ahead – at least give it a decent childhood. I am with you on this…not a big fan of digging holes…especially large ones. I try to enlist my husband to dig those large holes, but if he is not availabe or cannot be coerced…I try to wait until after a rain when digging is easier. The first time I adequately prepared the garden soil was when I put in an herb garden for my wife. I used the post-hole digger on the tractor to do what all the English garden books say you must do — double-dig the soil down to two feet. I mixed in a ton of compost and then tilled the whole thing up. It was such a pleasure to then put in the plants (and to add and subtract each season) that this is now our standard approach for any place that I can reach with the auger. And if I can’t get in with the auger, it’s then pick-axe and shovel until I’ve reached about as far as I can go by hand. And then I build up the soil to higher than ground level to get that same feeling of being able to shove a trowel in on the first try. Mind you I did put in many partially dug gardens before I finally realized what a long term dividend that proper preparation yields.